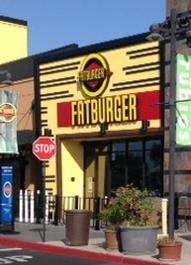 Exceptional opportunity to buy an established Fatburger restaurant with celebrity customers. Beautiful, established, one year old turnkey co-branded Fatburger fast casual hamburger restaurant and Buffalo’s Chicken Wing restaurant in a busy and popular location. Franchisee that built the store moved out of the country. Corporate is aiding in the resale of this restaurant. 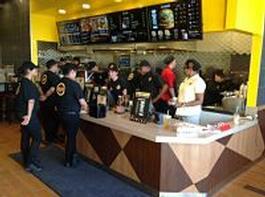 Fatburger is only as successful as its franchisees and the brand operates on this belief. financing available to qualified candidates. Over the last 60 years, Fatburger has built its reputation as America’s best fast casual, gourmet hamburger restaurant. Since the Fatburger brand began in 1952 in Los Angeles, Fatburger has grown from being the favorite hamburger restaurant for Los Angelenos and celebrities to dine on big, juicy, tasty, fresh, made-to-order burgers, into a Hollywood icon of its own. The Fatburger menu is designed to give customers what they want, fresh, big, juicy, tasty Fatburgers. The Fatburger menu also features delicious turkey burgers, veggie burgers and chicken sandwiches. The Fatburger menu offers its customers the ability to customize their burgers to their taste, giving them the choice of multiple add-ons and sauces to add to the famous Fatburger taste. The Fatburger menu also includes hand-scooped 100% real ice cream milkshakes, ice cream sandwiches, and root beer floats. Fatburger restaurants serve “Fat Fries” (steak fries), “Skinny Fries” (traditional French fries), and homemade, hand battered onion rings that are prepared fresh daily. Fatburger is focused on an ever improving customer experience while constantly delivering the famous “Fatburger” to its loyal fans and customers all over the world. Catering to the stars and its loyal fan base of Fatburger fanatics, today there are over 150 Fatburger restaurants operating in over 25 countries worldwide with major growth territories still available for franchise development. Fatburger believes in maintaining strong relationships with all of its franchisees and is dedicated to helping franchisees build successful and sustainable restaurant operations. The Fatburger brand is committed to helping its Franchisees build top-line sales that support profitability with Fatburger’s famous products and support. To Find out more about this Fatburger restaurant for sale, please fill the form below and submit. Chula Vista - California - $150000 SOLD!